Create an interactive educational kiosk in the Epcot Innoventions pavilion at Disney World. Disney needed a fun interactive medium to entertain and educate visitors on sustainable forest issues in the Epcot Innoventions pavilion. This installation needed to appeal to both children and adults while comprehensible to foreign visitors. 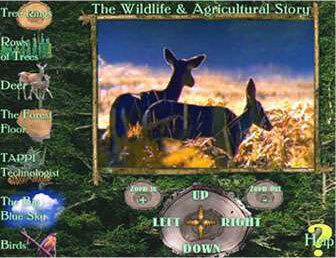 Studio360 developed “The Wildlife & Agricultural Story,” an immersive environment kiosk with a 360-degree forest panorama and seven educational videos. 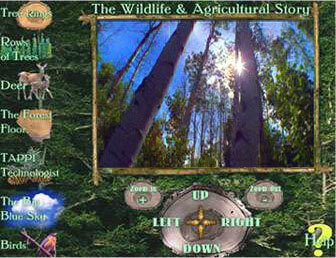 We designed the user interface with a touch screen for specific images to launch the videos. 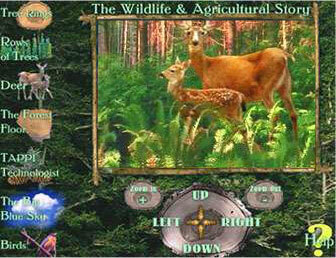 The program includes a help screen and time-out feature that auto-rotates while the kiosk is not in use. To maintain the forest theme we designed the kiosk to fit in a replicated tree within the pavilion. It has become a popular attraction and successfully educates and entertains a wide variety of visitors.